The stage was all set up for Argentina, until now (and probably still) the single biggest frauds in a tournament defined by fraudhood, to succumb to their misery and die the death they seemed destined for. Somehow, they fought to live another day. It might not look like much at first glance, but that goal is stunning. Banega’s pass is perfect. Those two touches Messi took, one to control the ball and a second to lay it out in front of him so that he could shoot, were spectacular. His right-footed across-the-body finish was great as well. In Banega, Messi finally had a player who could find him in advanced positions for a change, and it took almost no time at all for the pair to combine and give Argentina the critical early lead. With the goal in hand, Argentina could settle down into a state of confident determination with a tranquility that has so obviously been missing from this group dating back to the qualification process, when they came a whisker away from missing out on the World Cup entirely. However, while nerves contributed a large chunk to Argentina’s under-performance, most notably during the disastrous outing against Croatia, the team still isn’t good enough to comfortably beat a team even of Nigeria’s quality. That meant Nigeria had their fair share of dangerous attacking chances once they’d played their way into the game after Argentina’s hot start. The penalty Nigeria were awarded and which Victor Moses scored in the 51st minute might have been a little soft, but a Nigeria goal had been coming anyway. 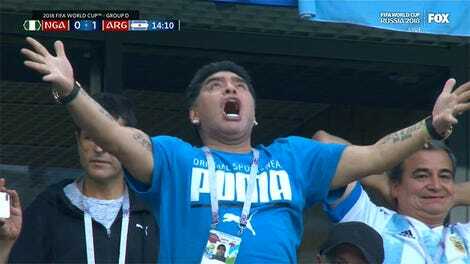 That goal turned the tide of the match and set things up for yet another agonizing Argentine heartbreak. With the scoreline now level, the anxiousness Argentina looked so thankfully free from at the start of the match returned. Argentina pressed wildly for a second goal they seemed too panicked to actually create, Nigeria feasted on the wide open spaces their opponents left for them on the counter, and the Super Eagles easily could’ve scored again themselves. Nigeria were just a little too lax with their scoring opportunities, though, (and thankfully the referee decided against awarding what would’ve been a scandalous penalty call after Marcos Rojo mis-headed a ball onto his own arm in the Argentina box) and so they too couldn’t get themselves go-ahead goal that would’ve piled the pressure on Argentina and all but sealed Nigeria’s place in the Round of 16. 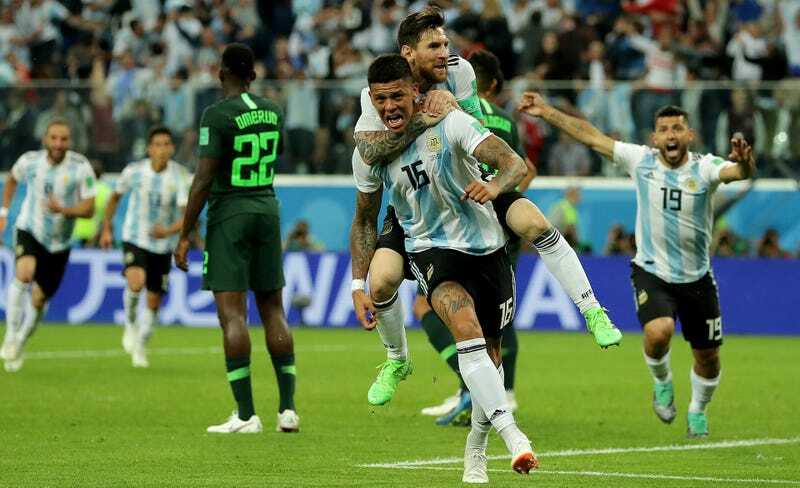 That’s right, Argentine defender Marcos Rojo wandered all the way up from his designated spot in central defense, found himself in Nigeria’s penalty box, and calmly slotted an incoming cross into the net with a beautiful right-footed volley. Marcos Rojo, who is so goddamn left-foot-reliant that his previous career World Cup highlight involved him doing a rabona clearance under pressure in his own box to avoid using his right, smacked a perfect volley with his weak foot and won Argentina the game. Messi never gets bailed out by his teammates in international play, but today help finally did arrive from a player and a foot absolutely no one would’ve expected. Because Argentina beat Nigeria and Croatia beat Iceland in the group’s other match, Croatia advance to the next round as the Group D winners while Argentina go on as the runners up. That means the Fightin’ Argies will face France in the Round of 16. While Argentina finally played with freedom and some semblance of coherence today, and France haven’t been very impressive in their own right, the French should make easy work of their old and slow and under-talented Argentine opponents. Argentina couldn’t beat Iceland, got demolished by Croatia, and needed a late-game volley from a center back to eke past Nigeria. Don’t let this exciting victory distract from the fact that Argentina remain huge frauds whom no one should expect much of anything from in the coming matches. However, Argentina’s chances of making a deep run in the World Cup are a concern for another day. Today, Argentina had to fight for their World Cup lives and in some cases their reputations as players and people, and they won. Had Argentina failed to beat Nigeria and gotten ousted from the tournament at the first opportunity, it would’ve been the lowest professional and maybe even personal moment in many of those players’ lives. But they didn’t. And that is enough reason for them to enjoy themselves now for a job well and courageously done.